Self Sufficiency Hen Keeping by Mike Hatcher is one of a number of new books I have seen appear on the shelves recently and I decided it was time to read it and let you know what I thought. More and more people are starting to keep chickens and if that’s you, as a beginner, you will find this book contains everything you need to know to get started. Mike Hatcher Judging at the DWC Show Stoneleigh 2009. Photo Courtesy Rupert Stephenson. Mike Hatcher, retired President of the Poultry Club of Great Britain has had a life long love of poultry. He started with a qualification in Poultry Husbandry from Lancashire College of Agriculture and had a career in the commercial poultry sector before moving into pure breeds. 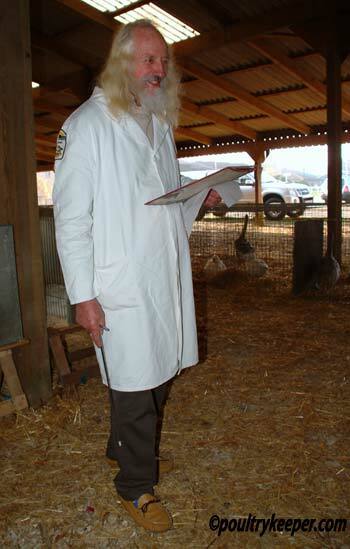 Mike regularly writes for poultry magazines such as Fancy Fowl and has judged birds in America, Canada and Holland as well as at home in the UK. With a lifetime’s experience of poultry, it’s no surprise that Self Sufficiency Hen Keeping is authoritative and well written. 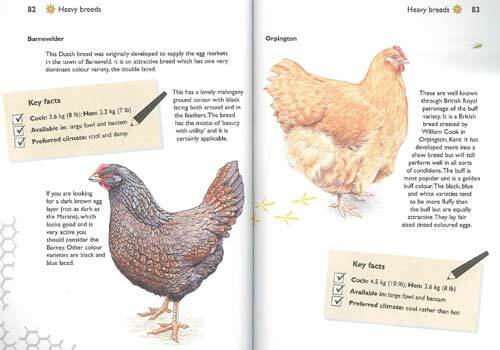 Hen Keeping is a comprehensive beginner’s book and a good introduction to some of the key aspects of keeping chickens. A little over half of the book covers the basics from choosing your birds and getting set up to essential routines and winterizing your birds. There is a section that covers the basics of disease and illnesses, as well as advice on finding a poultry vet (don’t forget our poultry vets database too). I thought the information Mike provides on feeding was particularly good. Most books (and please pardon the pun) only scratch the surface when it comes to feeding, assuming you will only ever feed layers pellets and mixed corn from a pet shop. Mike covers the standard feeds but also gives valuable information on feeding mash, kitchen scraps (in moderation) and covers the different kinds of grains and their nutritional benefits: Maize during the cold winter months for example. An excellent tip I picked up was that you can ‘sprout’ grains on a wet tray, using them as nutritious treats for your chickens. Can you guess what I’m doing at the moment..?! The second half of the book covers heavy, light and bantam poultry breeds where the more popular breeds are covered with sufficient detail for the beginner to make a decision on the most suitable breed for them to keep. As you can see from the example page above, each breed has a coloured drawing and a box containing the ‘Key Facts’ for each breed which I found a useful quick reference when flicking through the book. If you are attracted to keeping hens for a more sustainable and organic lifestyle then this book will be a valuable reference, giving you a head start. With an RRP of £7.99, and (at the time of writing) retailing at £6.39 on Amazon. I think you can’t really go wrong for this price. Have you read this book? If so, please leave your review in the comments box below to let us know what you think. Tim is the founder of the poultrykeeper website and lives in Herefordshire, UK. He keeps Cream Legbar chickens, Silver Sebright bantams and hybrid layers for eggs, Abacot Ranger ducks, Brecon Buff geese and some quail.